Maria and I first became friends via this blog, ain’t the internet great?! 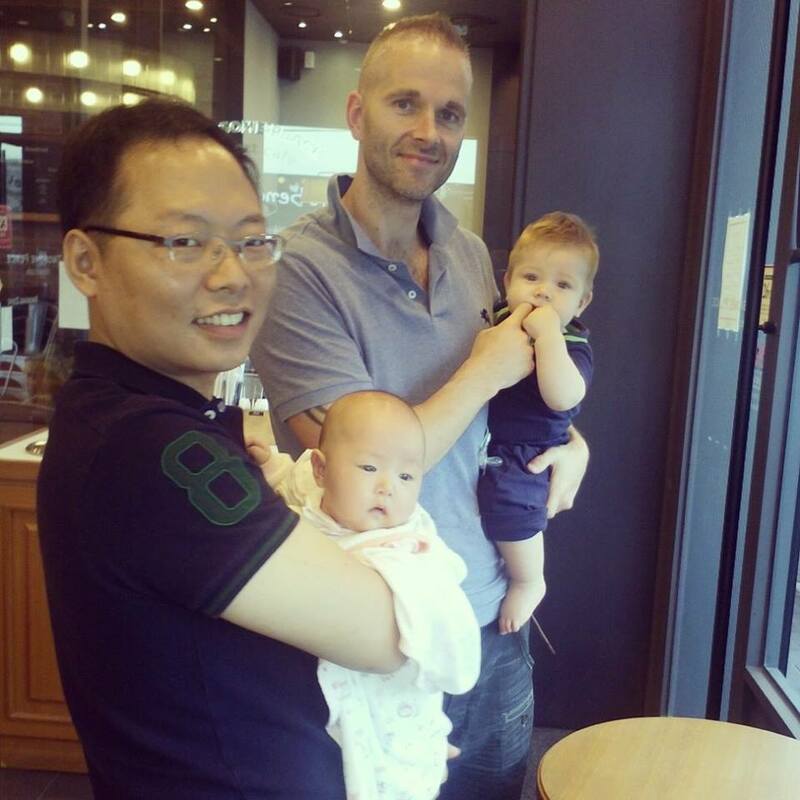 – Maria had recently moved to South Korea from Newcastle so we got chatting about moving away while she was 5 months pregnant…I thought this was brave but Maria and her husband Adrian have adventure in their souls so they were just ready to move on. 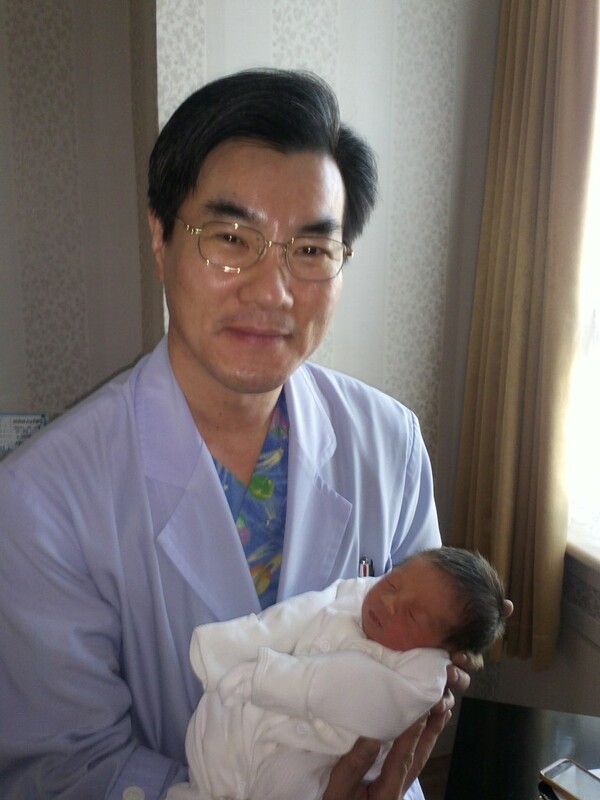 Fast forward to December and Maria and AJ (as Maria calls him) had their baby boy, Nathaniel, in what sounded like an amazing hospital in South Korea. Being the nosey person I am, I badgered Maria into giving me all of her birth story details. This birth story was NOT what I was expecting! I’ve been meaning to share this with you for a while but the August survey and some personal messages from you guys saying “we want more birth stories! !” meant I just had to finally pull my finger out. Expect high drama, tears (yours, get a tissue now), and a beautiful little boy. What is so endearing about this tale is how Maria comes across, she writes in such a lovely way that I feel like I’m sitting next to her listening, rather than reading. Along with adventure, she also has eternal optimism in her soul! 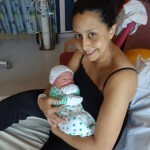 – she’s writing this 4 months after the birth, but still, what she went through makes anything I was moaning about pale into insignificance (And to be honest, instead of being scared of having another, I should look to Maria and just man up!). I also love that I now know more about her hospital in Korea than I do my own where Reuben was born…I don’t know even know the names of either of the midwives who delivered him. Sad. The other thing that touched me about this story is just how amazing other cultures can be – within weeks of moving, they had made friends for life who were willing to do anything for them. I’ve hardly edited the way Maria has written this, so you can get the full effect. Enjoy! Hi Hannah!!! I could write a book with all the experiences we have had since we arrived in South Korea 8 months ago. There is soooo much to tell that I am going to summarize it hahaha! Adrian and I only lived in Newcastle for 4 years as I am South American, from Costa Rica, and Adrian was previously living in Australia. When we got married the UK seemed a great place to start married life. After 4 years we felt that it was time for a new adventure as we have both lived overseas and travelled lots before. We met travelling 7 years ago so we shared a passion for experiencing new cultures. That’s how at 5 months pregnant in August 2012 we arrived in the hottest summer (38 degrees) in South Korea. Adrian is a teacher and I am now a full time mum to little Nate. We live in the South East Coast 3 hours away from Seoul in a lovely Coastal City. We love our neighbourhood everything is walking distance, even Adrian’s work and the Hospital, where Nate was born, is 2 minutes away. The following weeks after our arrival were a complete adaptation process. My parents arrived one week later to visit us as they live in Philippines so it’s been great having them a 3 hour flight away. We had absolutely nothing only our 4 suitcases! We had to set up a completely new home from scratch. So my parents came furniture shopping with me and helped choose some great things, since Adrian was at work, by the time they left we had a fully furnished lovely sweet home. We live in an apartment block in a lovely, safe area. Within the first week we met our friends Anne and Ikzu. This couple have been more than friends they feel like family. They have both gone out of their way to help us out with everything especially when I was rushed into hospital on December 7th at 34 weeks. For 3 days both of them rushed to be with us, and Ikzu drove 3 hours the next day with Adrian to meet my mum in Busan Airport. 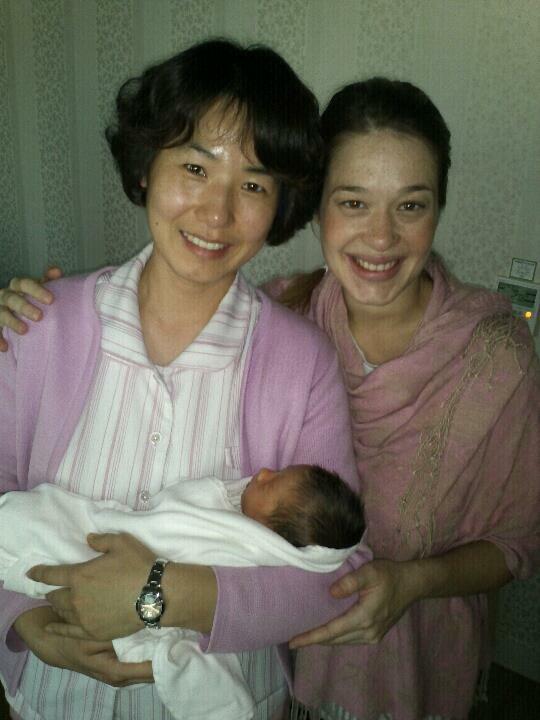 This is where our story in South Korea really begins, Hannah, and if I could someday I would blog about my story about giving birth in an Asian country. It was December 7th at 4am when I began vomiting non stop and Adrian rushed to me Hospital. My amazing Doctor (Doctor Bear, yes, cool name) was there waiting for us. He had seen me since I was 20 weeks every 2 weeks for scans and check ups. When he performed the vaginal scan at that time in the morning I was 2cm from giving birth. Very scary. I was put on a drip immediately as I was dehydrated (because I had been in the loo all night) and the contractions were so painful. Dr Bear told us that it was too early to deliver and that he would put me on a 12 day treatment to retain Nathaniel and give time for his lungs to get stronger. This took us to 36 weeks but the treatment was harsh for my heart so I had to be monitored 24 hours a day for 12 days before I could deliver. The weekend that I was admitted to hospital on Sunday night Adrian began feeling bad and he had food poisoning from a Sandwiched he had from a Café, bless him. Hannah, it was terrible he had the runs and was vomiting non-stop while I was with the drip in bed. My goodness, I stood up to go and see him in the toilet and I was laughing and crying at the same time! This was the last thing we could have wished for! Thankfully Miss Kim, my lovely nurse, got him some medicines and he recovered so by the time my mum arrived the next day we were both in bed! She wanted to cry too! Those 12 days Adrian, my mum and I moved into hospital. 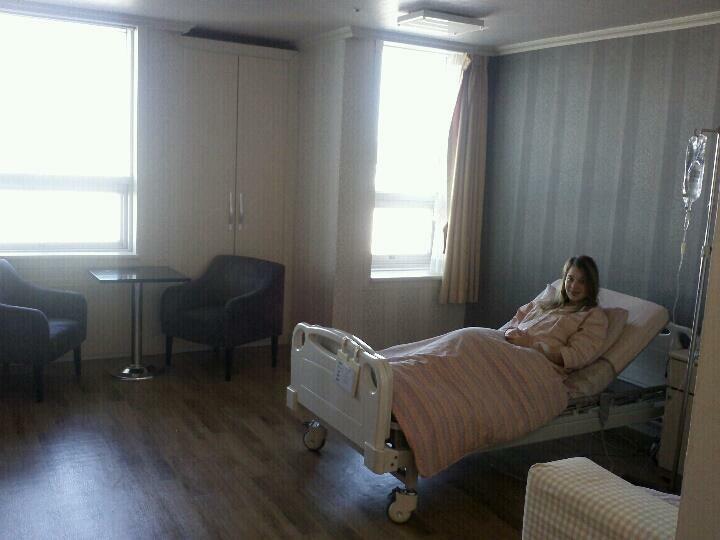 The hospital is lovely though and I had my own private room, which was very comfy but my health was going down hill and I began losing weight. I had 2 nurses with me at all times, Miss Kim and Semi. These two girls were magnificent and when I would cry they would cheer me up or rub my head. They were simply devoted to their jobs. I was put on a Western diet (!) as Koreans only drink seaweed soup, rice and vegetables in hospital and my body is not made for that! The first seaweed soup they gave me had a fish head in it. OMG! So, Dr Bear ordered a special diet for everyone, for Adrian, my mum and I! It was very funny the 3 of us would have breakfast, lunch and dinner together. Everyone was exhausted as the nurses would be in and out of the room all day and night monitoring my heart rate, and if I got palpitations they would lower the drip and then the massive contractions would begin. It was up and down non-stop. Dr Bear would come and see me 3 times a day in my room (I can’t thank him enough for how devoted he was too). The weekend before I gave birth I got sick with what I thought was a cold. It turned into Pneumonia and Monday December 17th I had an emergency C-section. There was no way I could have been under general anaesthetic given my condition, so I had an Epidural. Only half of my belly went numb as my body was not taking in any more medicines and involuntarily my body rejected the anaesthesia and with 2 surgeons, nurses and Adrian by my side Dr Bear proceeded with the operation. Hannah, I felt most of the operation but Nathaniel’s life was at risk and so was mine so all I did was look at Adrian all the time during the operation while he held my hand. There was loss of blood and it was hard to take the little stubborn man out, hahaha! Once he was out I was given a sedative straight away and Dr Bear ordered for Adrian to be taken out of the operating theatre. It was scary for AJ, my poor husband, and I have no recollection of anything until I opened my eyes in my room and Adrian, my mum, Anne and Iksu were by my side. My mum was outside beside herself with worry, with Anne and Ikzu , and she told me that when Adrian came out of the operating room, he burst into tears and cried lots. He was shocked to see me in such vulnerable state. I spent 17 days in hospital recovering and getting treated for Pneumonia, by the time I came out we had made friendships for life; the nurses, doctors, kitchen staff where simply amazing. We see them all the time now as that’s the hospital where we take Nate to see his Paediatrician, Dr Kim. I see Dr Bear there as well and even AJ gets medicines there when he has been sick…funny as it is an all women hospital but the staff have bonded with the three of us! Even when I was weak I requested to have Nathaniel in the room with me (here in Korea the babies stay in the nursery until the mum leaves the hospital) so our little man was with us in the room and I got my bonding time with him. Something I found very very interesting was that after my operation the Doctor would put these very heavy, hot packets on my belly for 6 hours to avoid inflammation. I was also given seaweed pills for 10 days to contract the uterus again – effective and interesting! After I had recovered and come home, AJ and I were finally able to cry and hug each other. We had been so strong for weeks so it was so good for the soul to just cry it out together. 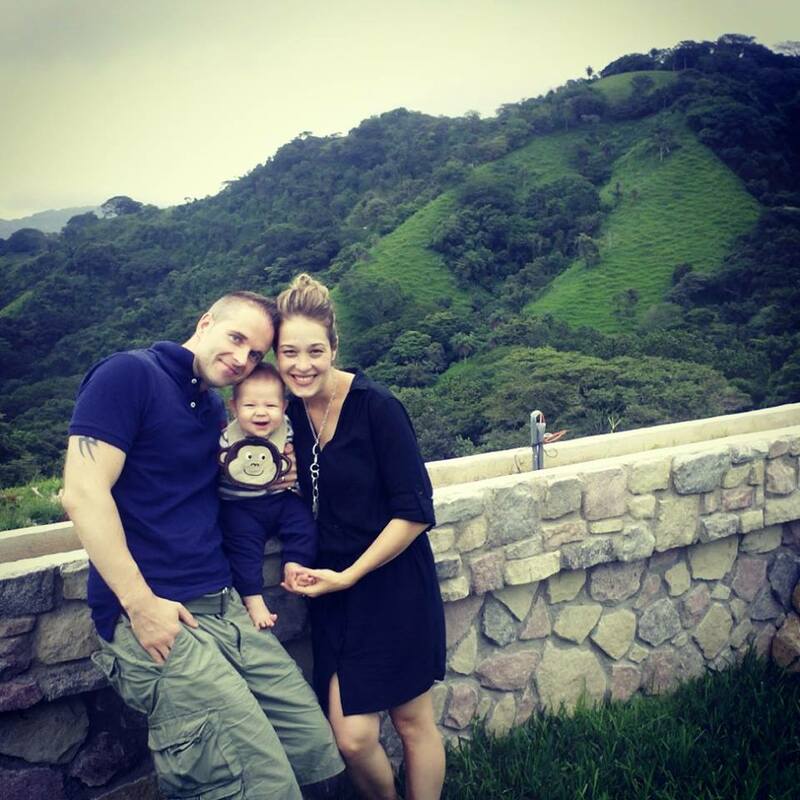 He would hug me and tell me, “I thought we were going to lose you and I had no idea how to live life with our son without you.” It was very emotional Hannah, but only the power of God gave me the strength to pull through. 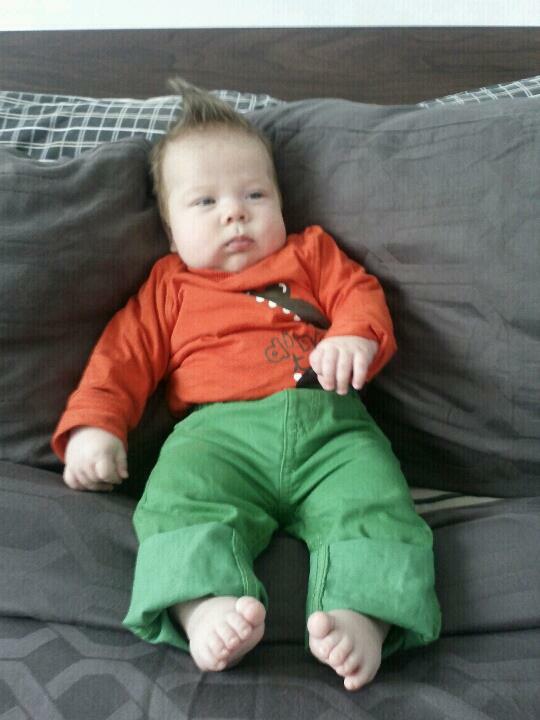 Baby Nate, 4 months at the time this was written – he’s definitely recovered! Thank you so much for sharing your amazing story with us and telling it so intimately, Maria. I’ve got tears again just doing the final edit! Maria has become my sort of pen friend and likes to send me little nuggets of ideas (such as for Reuben’s teething – as he and Nate are demonstrating exactly the same symptoms – she has suggested trying Camilia, Teething Relief, as it worked really well for Nate) and has also been sharing photos with me of her life in South Korea with a babe. I literally can’t believe how big Nate is! For someone who entered the world as such a fragile little thing, he is a giant. Maria says he’s wearing 18-24 month clothes! Nate at 8 months in 18-24 month clothes! 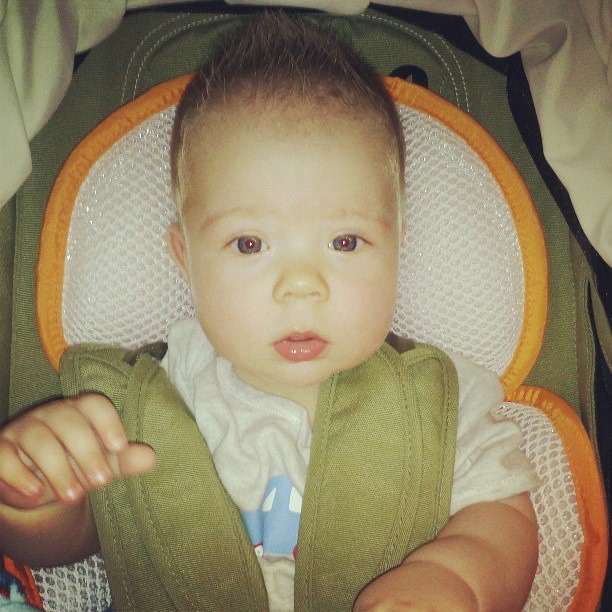 And hair like his daddy! Also, Anne and Ikzu, remember them (I know, I feel like I’m friends with them too now), they’ve had a little bambino too – baby Sia! Maria also asked me if I would share this, so although it seems like I’m blowing my own trumpet, it is lovely to hear such nice words! Absolutely fab post, Hannah! Thanks so much, Maria, for sharing your amazing birth story – I was captivated from the very first line! 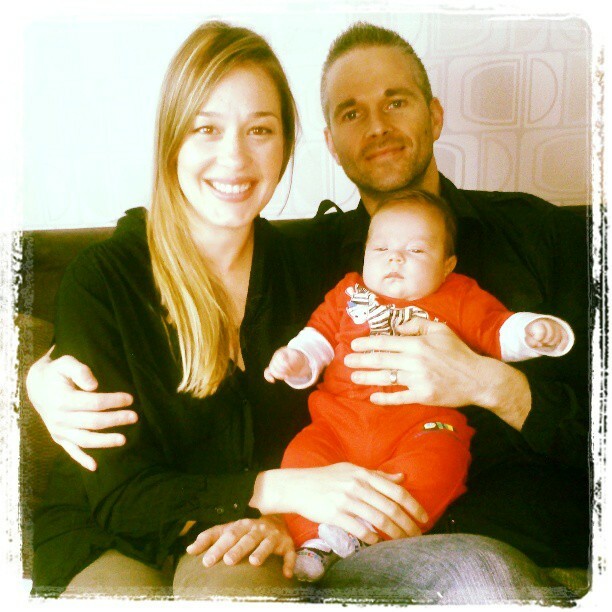 Would definitely sign up to hear more about raising a family in South Korea if Maria ever plans to start her own blog! Awww thank you Nikki. I do plan to start my own blog once I have some time on my hands :).I do everything full time as we have no family here so Nate takes over my life completely hahahaha! And yes Hannah’s blog is simply amazing I have got my friends from around the world reading her blog and they all love it. What a lovely story. And I thought my birth was dramatic! It puts things in perspective to hear other stories. So happy everything worked out for the family 🙂 Hannah, I love the idea of sharing birth stories from around the world! Excelente historia!! Muy emotiva! Maria definitivamente debería de iniciar su propio blog! aww thank you :)that’s so kind of you! its an amazing story.lovely boy! How much is a ceasarian ?